The main commercial section through the village of Middleburg comprises five blocks. It's known as Washington Street. The "Over The Moon" column originates in a cramped second floor office on West Washington Street, which overlooks the post office, bank and liquor store. People drop in with news and word travels rapidly in a small town. Recently, the writer received an announcement. 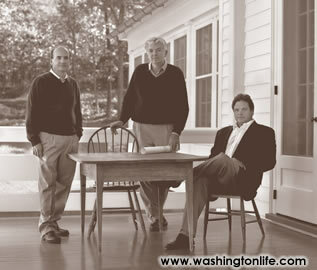 Architects and partners David Neumann, Andrew Lewis and Mark Buchanan have organized a new firm: Neumann Lewis Buchanan Architects, with offices in Washington and downtown Middleburg. David Neumann founded the practice (originally known as Versaci Neumann and Partners) in 1986 with an office in Washington - three years later a Middleburg office opened. In the past 20 years, the group has won numerous design awards and their work has appeared in major shelter magazines. The partners consider the firm's most successful projects those where no distinctive architect's mark is visible - the house that "looks like it has always been there," said Buchanan. "One of the highest compliments we receive is the question: â€˜When did you restore that great old house?'" Middleburg's own Gary Baker was recently bestowed with the Pegasus Medal of Honor by the United States Equestrian Federation. The award was presented at their annual convention at the Seelbach Hilton in Louisville, Ky., in recognition of individuals who have exhibited outstanding service to horses and the sport. 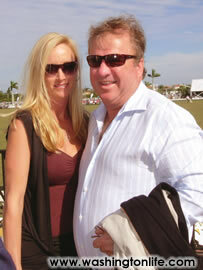 Baker has been a familiar face in Middleburg for many years and has a diverse interest in horses. He can be seen coming and going from the post office almost daily. "Truthfully, I'd say I was totally surprised and overwhelmed," Baker confessed. "I've had phone calls from people I haven't heard from in years." The Masters of Foxhounds Association celebrated their 100th anniversary year with a sensational Hunt Ball at New York City's famous Cipriani. The gentlemen wore traditional formal scarlet tails and the ladies were sparkling in elegant gowns as many sipped Bellinis (the signature beverage at Harry's bar in Venice), and danced as only fit and energetic foxhunters can. This of course included a Middleburg contingent: Gail and Malcolm Matheson, Nelson Gunnell, Sandra and Jim Atkins, Scott Abeel, Viviane Warren, Mary South Hutchison, Susan Fitter and Garrick Steele. Steele has also been traveling south to play polo in Wellington, Fla., where horse lovers of all kinds gather for the winter. Those who aren't at the International Polo Club are over at the horse show. Julie Coles is busy with her daughter Sloane, who is a star in the show ring. Mary Lea Treptow is down for the winter with her daughter Ainsley, while Jim Treptow commutes and checks in on a string of racehorses at a nearby training center. Lila and Roy Ashe have sold their 1,100-acre Upperville estate known as Llangollen. The Ashes purchased Llangollen, which once belonged to Liz Whitney Tippet, in 1989 for $6.9 million. This time around it was listed for $22 million. This is only the second time in 77 years that Llangollen has been sold and both times the change of owners was facilitated by Thomas & Talbot Real Estate. Anita Sisney of Armfield, Miller and Ripley was the listing agent and Mary Ann McGowan of Thomas and Talbot was the buyer's agent. 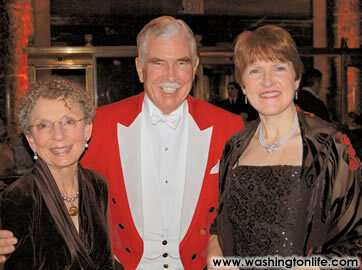 The new owner is Llangollen, LLC, held by Donald P. Brennan and his wife Patricia. The Brennan's daughter, Maureen Brennan, will oversee the farm. The entire estate is in conservation easements and will not get split up. And best of all, the new owners have horses. There are several other real estate transactions of note. Washington Post Company Chairman Donald E. Graham sold his 510-acre Glen Welby Farm, which once belonged to his late mother, Katharine Graham. The price was $9,081,000. No official word on the new owner. The word on the street is that it will remain in the family ... but stay tuned. sold their 50-acre home known as "The Farm At Little River" to the former superintendent at VMI Josiah Bunting III and his wife Diana. (Asking price was $2.5 million.) Mrs. Bunting's sister Marian Cunningham, a champion dressage rider and judge, lives in Aldie. Meanwhile, the Richards are busy building a new place right around the corner in Rectortown. Lou Kennedy, a dynamo who runs several businesses in addition to working for many local worthwhile causes, has purchased JML French Antiques in Middleburg. She's sent word from the other end of the street that "the Duchess has returned." This would be the one and only Lillian Griber, who will manage the shop on East Washington Street. More from West Washington Street next month. Cheers.